Thorough research; good presentation; high quality photos and illustrations. Highly recommended to anyone interested in the Bf 110 from either a modelling or historical perspective. 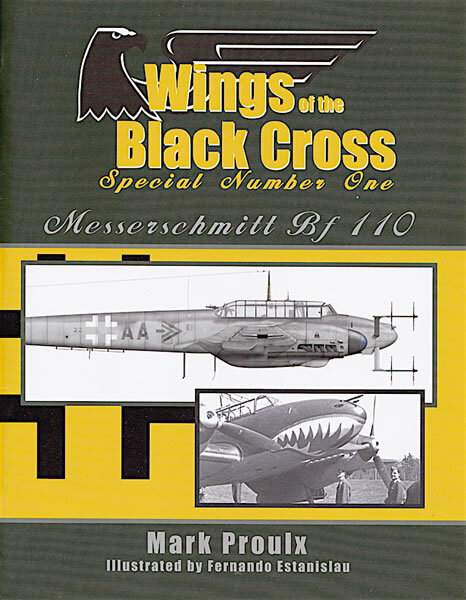 Eagle Editions’ “Wings of the Black Cross” series has established itself as an authoritative source on the colours and markings of World War 2 German aircraft. Series authors Jerry Crandall and Mark Proulx are consistently shining new light on this fascinating subject, using mostly black-and-white period photos as the basis for their interpretations. Making their research even more impressive is the variable quality of available photos and the fact that many are of damaged or derelict aircraft, which means it can be challenging to nail down colour schemes, unit markings and sometimes even aircraft subtype. Mark Proulx's 'Special Number One' on the Bf 110 takes a different path to previous books in the series, which have presented a mix of Luftwaffe aircraft rather than concentrating on a specific type. However it's a welcome shift in focus! By choosing a single subject, Proulx has been able to construct a photo narrative of Bf 110 camouflage from 1939 to 1945. He writes in the Preface that "beginning with the Bf 110 B and culminating with the late war Bf 110 G, each of the major variants are scrutinised....[and] the design and markings development of the Bf 110 is closely examined". 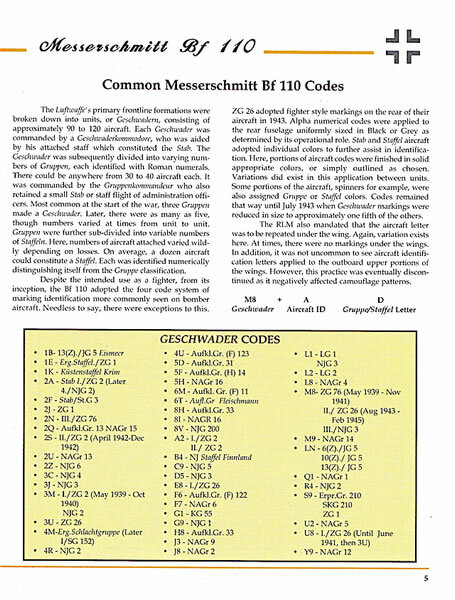 A Wespengeschwader Bf 110 E coded ##+DP. Individual aircraft letter "D" on rear fuselage and spinner tips are in Yellow. Attached under the fuselage is the ETC 500/IX bomb rack, commonly fitted to the Bf 110. The addition of the ETC 50 underwing racks, seen here fitted as two pylons per wing, forced the Balkenkreuz to be moved further outboard on the wings. External fuel tanks were of 300 liter capacity. Some, but not all, photos are supported by full-colour profiles and/or scrap drawings by Fernando Estanislau. The scrap drawings are of the forward fuselage/nose area and show nose art than can be obscured by the engines in a full profile. 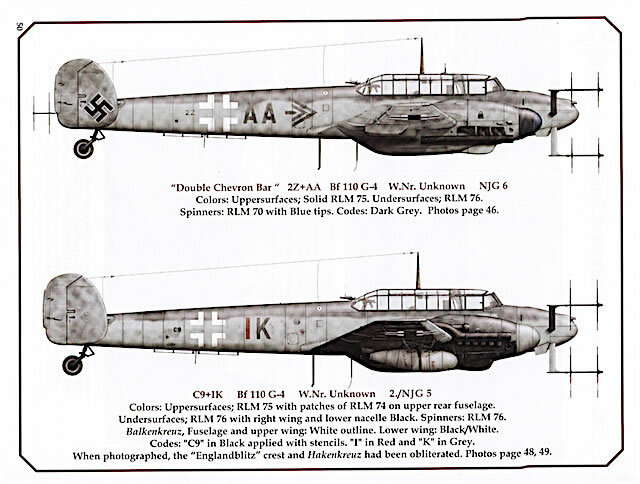 The profiles are accompanied by captions that list identification codes, Bf 110 subtype, W.Nr (if known) and unit, before going to describe camouflage and marking colours. For ease of reference, the captions also link the profiles to the page number on which the photo of the aircraft appears (and vice versa). In some cases there are also references to other "Wings of the Black Cross" books in which photos of the same aircraft appear. 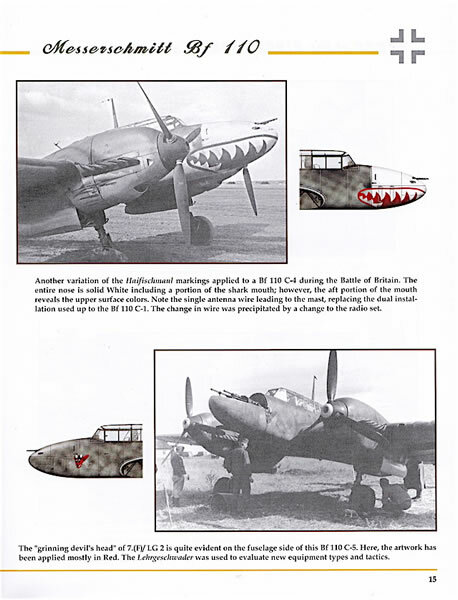 The photos and drawings are arranged chronologically so, as promised, we are able to follow the evolution of Bf 110 camouflage throughout the war – from early Dark Green/Black Green over Light Blue schemes to the subsequent myriad combinations of grey. Theatre and role specific camouflage are also covered – for example the use of white distemper in winter and black on early nightfighters. Arguably more interesting than the broad camouflage canvas, however, is Proulx's interpretation of unit and theatre markings along with the anomalies that inevitably crop up. 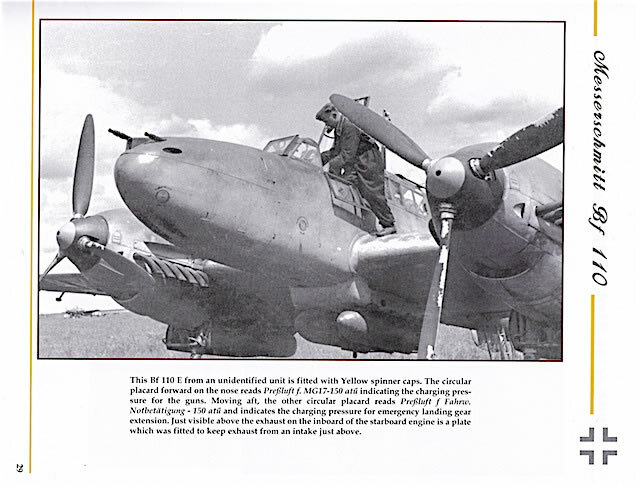 These are the idiosyncracies that can spark interest in a particular modelling subject – in my case, for example, it's the two Bf 110 Gs on pages 48-51 that were photographed in a derelict state at the end of the war. I've been looking for a subject for my Eduard 1/72 Bf 110 G Weekend Edition kit, and now I think I've found it – or at least narrowed down the field! The book ends with a list of suggested reading for anyone interested in further research. Printing and production quality is high. Most of the period photos are very good, and those that aren't are acknowledged as such and included for a specific reason. 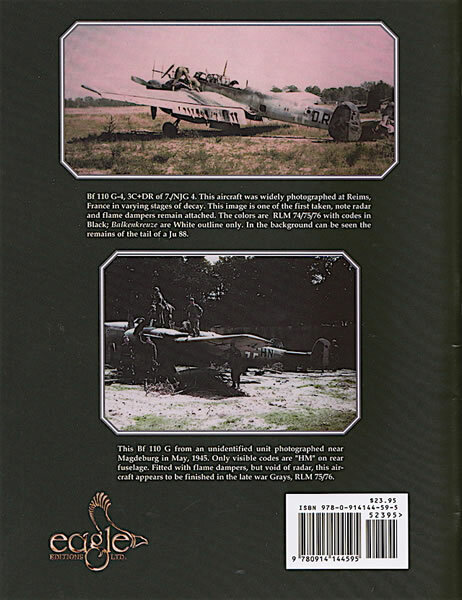 I did find one typo – on the back cover in a caption supporting one of the book's two colour photos – where a Bf 110 G code is described as "HM" when in the photo it's clearly "HN". I'd be surprised if there are many more such errors, though, because Proulx's and Estanislau's interest in their subject and commitment to accuracy are evident throughout the book. This Bf 110 Special is a great addition to the "Wings of the Black Cross" catalogue and should be sought out by anyone interested in the Bf 110 from either a modelling or historical perspective. The two things I like the most about the book are first, that it looks at all Bf 110 variants and therefore gives a complete overview of camouflage and marking development; and secondly, the commitment to pointing out and explaining specific features. It's a volume I'll definitely be turning to when I start my Eduard B 110 G – and probably beforehand as well. Thanks to Eagle Editions for the sample.